May 19, 2016, 8:45 PM · The Calidore String Quartet has won the $100,000 grand prize in the inaugural chamber music M-Prize Competition, hosted by the University of Michigan School of Music, Theatre & Dance. "The Calidore String Quartet is a perfect example of the extraordinary talent that we seek to showcase with this competition," said Aaron Dworkin, dean of the Michigan School of Music, Theatre & Dance, and driving force behind the foundation of this competition as well as the Sphinx Competition. "We are thrilled with this inaugural year and we are confident that it will develop audiences and awareness for this genre, which has the potential to play such a vital role in the careers of today's performing artists." Members of the Calidore String Quartet accept the 2016 M-Prize Thursday in Ann Arbor, Mi. The New York City-based Calidore String Quartet includes violinists Jeff Myers and Ryan Meehan, violist Jeremy Berry and cellist Estelle Choi. They are currently artists-in-residence and visiting faculty at Stony Brook University-New York and were appointed to the roster of the Chamber Music Society of Lincoln Center Two for the 2016- 2019 seasons. They were the first North American ensemble to win the Borletti-Butoni Trust Fellowship earlier this year and have won grand prizes in the Fischoff, Coleman, Chesapeake, and Yellow Springs competitions and top prizes at many other competitions. Announced last October, the M-Prize Competition received 172 applications from 13 countries, officially making it the largest chamber music competition in the nation and world. Twenty-nine ensembles, comprising 120 artists, were invited to participate in the semi-final and final rounds, which took place Tuesday through Thursday Ann Arbor, Mi. The competitors represented three countries (U.S., France, Germany) and 17 states. The competition is open to ensembles with three to eight members. Those ensembles can be from three different categories: Strings, Winds and Open. The "Open" category is for alternative ensembles that can include mixed instrumentation, technology, voice and improvisation. M-Prize is sponsored by U-M's Office of the Provost and received additional support from an anonymous donor. The annual competition will take place every May at the University of Michigan's School of Music, Theatre & Dance in Ann Arbor. 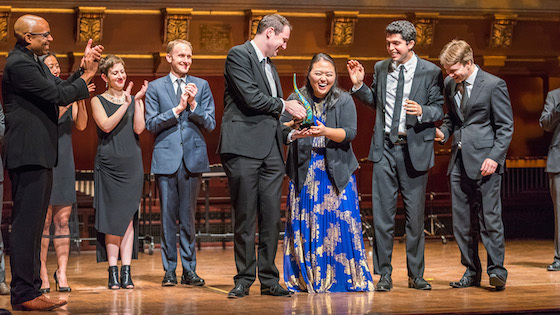 Jury members for the 2016 M-Prize included Rachel Barton Pine, Rohan De Silva, Anthony Elliott, Sylvie Gazeau and George Taylor in the strings category; Timothy McAllister, Sam Pilafian, David Shifrin, Toyin Spellman-Diaz and Gail Williams in the winds category; and Andrew Bishop, Joseph Gramley, John Hollenbeck, Cristina Pato and Mark Summer in the open category. BELOW: The Calidore String Quartet plays Felix Mendelssohn's String Quartet No. 2 in A Minor, Op. 13 - I. Adagio-Allegro Vivace.